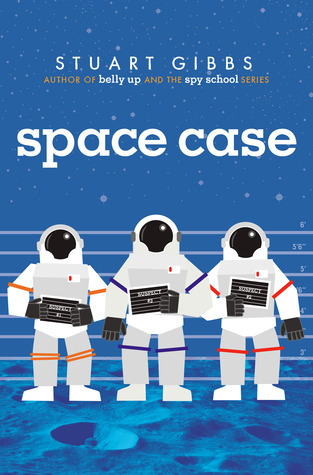 Space Case is the first in a new series by one of my favorite authors– Stuart Gibbs. The main character is Dash, a middle-school-age boy whose voice and experience will resonate with elementary and middle school readers. He has a younger sister he both loves and who annoys him. He loves his parents but is none too pleased at being dragged–because of their jobs–on a space adventure that has proved to be MUCH less exciting than he was led to believe in the beginning. The setting for Space Case is both compelling and intriguing: a murder mystery–maybe even a dangerous conspiracy–on the first human base ever established on the Moon. When the most well-known (and Dash thinks well-liked) scientist on Moon Base Alpha is found dead on the surface of the Moon Dash is convinced it is NOT an accident. Dash is awash in suspects: an intimidating Commander, a wealthy, spoiled, violent family (who paid millions to be the first civilians in space), scientists with hidden grudges and a frustratingly mysterious security accomplice. Dash encounters the familiar grown-up wall of disbelief when he reveals his suspicions to his parents. The Commander of Moon Base Alpha insists that Dash talk to the Base Psychiatrist to deal with reality instead of his crazy conspiracy theories about murder. Given that the psychiatrist is one of Dash’s main suspects and incompetent to boot, Dash is understandably frustrated at the way he is being treated by the Commander AND his parents. He resolves to prove his theory and find the culprit himself. Space Case offers a plot and an adventure complicated enough to be interesting yet not overly confusing. Stuart Gibbs strikes just the right balance between action and character to keep readers engaged and invested in the outcome. This is an ideal read for 4th -7th graders. I hope Space Case is the beginning of another great series by Stuart Gibbs in the tradition of his FunJungle and Last Musketeer series–both of which I highly recommend.